Has it only been 9 months? It feels like I've been blogging about ice cream forever. Well, I've been eating it forever, so now the two are kind of blurring together. As you can tell, the state of the freezer is kinda pathetic, it looks so empty. You can spy 6 containers of ice cream (there's a wrapped container of Edy's next to the homemade container with the green lid there). The box of treats is pretty empty too. I'm just not real excited by what's in the freezer right now. I really want a nice B&J fudge brownie, or maybe some Breyers Rocky Road. I should have taken the picture last Saturday when there was -11- containers of ice cream in the fridge. 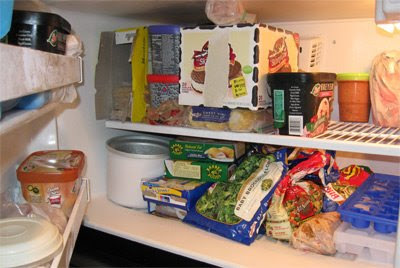 Actually, the freezer looks empty because usually there are a lot more breakfast foods in the fridge. The ice cream containers are also always wrapped in plastic bags, but I unwrapped them so you can see what's up. Ok, so that's the state of the freezer, what's the state of my blogging? It's been an interesting three months, that's for sure. I finally got myself a new job, but the workload has increased so I've been kind of burnt out by the time I get home, and so I don't blog as much as I should. Plus there is the ebb and flow of what's in the freezer. I may have a week where I'm dieing to blog, but the freezer will be packed tight with things I've already reviewed. I feel bad because there are times where I'm tempted to throw out half a container of ice cream just so I can get something new in the freezer. The point of the blog is to enjoy ice cream though, not take a bowl and move on, but hey, it's a learning experience. oh fantastic...now I want to go to the store and fill that empty space in the freezer. As I'm typing this, I'm trying to think of what I wish was in the freezer...I gotta go with Turkey Hill's Box of Chocolates. By far one of the best new flavors I've tried in the last 3 months. So goals before I hit my year anniversary? Well, I should definitely be able to hit post #250 before May 8th. I've been going back through the blog a piece at a time and updating any images I may have posted a little too quickly, plus I'm trying to post more pics as I move forward. my ultimate goal? Well, if you type in ice cream reviews in a search engine. You either get twodips.com or adailyscoop.com, both of which are no longer updated. So, my goal is to be up there, bringing quality reviews to everybody. Hey, we all gotta dream right? May the scoop be with you, always ...sorry, couldn't resist. Below are the results of our last poll - time to come up with another. How many flavors are in your fridge? 250 posts in a year? You can do it Dubba! !